Give the gift of luck this holiday season with this beautiful Singing Cardinal Snow Globe from CAREBOX! This beautiful Singing Cardinal Snow Globe symbolizes good luck for its recipients. 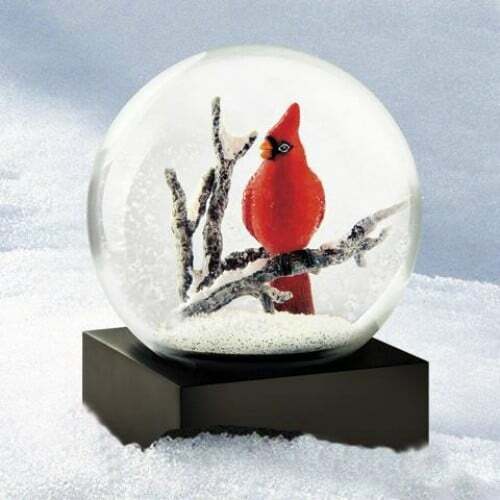 Made out of high quality materials, this snow globe features a bright red bird perched on a branch in the snow. Secured to a 4X4″ black base, this classic statement piece serves as a sturdy Christmas decoration or gift. Perfect to place over a loved one’s mantle as a constant reminder of well wishes, this product will show the recipient just how much you care! A bird that can be spotted all year long, the cardinal, is said to symbolize luck. Legend says that it is tied to the number twelve. A its eggs hatch after 12 days, and it can be seen all 12 months of the year. When it flies into your life, good luck is sure to follow within 12 days, 12 weeks, 12 months, or at noon or midnight! CAREBOX of San Francisco is built on the idea that giving is the best part of the holiday season. They believe in sending presents that promote health, healing, and hope. Their products were created as a means to give gifts that make people feel good and to promote happiness and well-being. CAREBOX wants to help you make spirits bright this holiday season with the gift of luck, so they are thoughtful enough to include a 15% off discount to be applied to your first purchase with the code “THANKYOU15.” In addition, they offer free shipping on orders of $50 or more.